Despite its victory over the messianic creeds of communism and national socialism, democratic capitalism, the economic-political system that has provided the nations of the West with an unprecedented degree of prosperity and freedom, faces extraordinary challenges in the new millennium. Not only has a fanatical form of Islam disrupted the peace of the postcommunist era, which some had wrongly heralded as the "end of history," Western societies also remain haunted by internal demons: egalitarian fantasies, moral libertinism, an arid and unsustainable secularism, a suicide of culture. Yet, in Democratic Capitalism and Its Discontents, Brian C. Anderson argues that nothing ordains the triumph of these demons over the democratic capitalist prospect. Drawing on a rich anti-utopian tradition of political thought, he defends the real achievements of the free society against an array of critics, from Jean-Paul Sartre and John Gray to John Rawls and Antonio Negri. 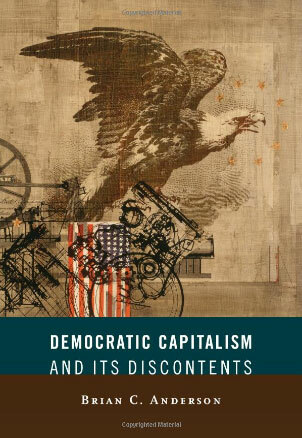 Anderson pays particularly close attention to the United States, the democratic capitalist nation par excellence, showing how it differs from other liberal democracies in its robust religiosity, vigorous civil society, and constitutionalism—all under threat from the American Left. Finally, Anderson explores the thought of some of the most insightful friends of the modern regime of liberty, including the brilliant French political theorist Pierre Manent and the godfather of neoconservatism, Irving Kristol. Crisply and vividly presented, Democratic Capitalism and Its Discontents is an essential guide to the conflicts of our time. Brian C. Anderson is the editor of City Journal, the cultural and political quarterly published by the Manhattan Institute, where he writes extensively on social and political trends. Formerly, he was senior editor of City Journal and a research associate at the American Enterprise Institute.